Incontrovertible pop fact: A disappointing album by an artist you love is much, much worse than a bad record by someone you never cared for. I still bear a grudge against Shirley Manson after she enticed me to pay money for Garbage's third album, in which the band finally lived up to their name. The fact that Mika's second album is a gaudy, unloved disaster zone, however, merely fills me with glee. I know I'm not alone in this: Alison Goldfrapp recently told me she refused to listen to anything Prince released after 1993, because it tainted her memory of the "good stuff". She's missing out, though, because the odd gem (Black Sweat or Family Name) is worthy of his 1980s purple patch. One band I'd written off after a difficult second album was The Scissor Sisters. Compared to the hedonistic disco of their first record, Ta-Dah! was oddly forced and joyless. The wind had gone from their sails; the helium balloons had deflated; The vim had left their vimto. 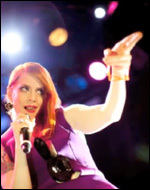 But how about this: The Scissor Sisters' new material is 100% back on form. The band officially announced their third record, Night Work, yesterday (although they've been talking about it since last August) and released a brand new preview track called Invisible Light. A full six minutes of twisted disco, it features Jake Shears' criminally underused tenor voice, and a Thriller-esque spoken word segment about Babylon and lasers by Gandalf himself, Sir Ian of McKellen. Best of all, the track suggests the band have ditched all that Elton John frippery and reconnected with their filthy gorgeous New York club roots. The sleazy, claustrophobic synthpop sounds like vintage New Order vs The Pet Shop Boys, and comes courtesy of Madonna's former musical director, Stuart Price. The Scissors have mercifully uploaded the clip to YouTube (YouTube) so you can hear it right here, right now. Fantasmajesticles.